Thanks to David's work we had free tickets and great seats. I would LOVE to show you how close we were to the stage BUT unlike the majority of the crowd, I do not have a phone that can videotape or even take pictures (again, showing how behind I am with the times). 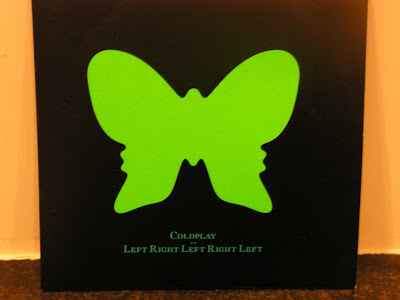 But I can show you the cover of the free CD Coldplay gave away after the concert. 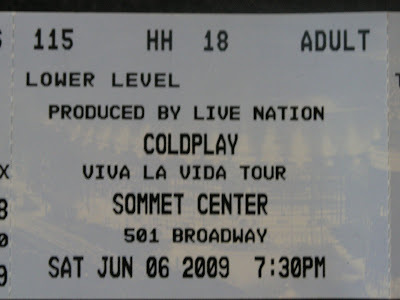 This was one of the best concerts I have been to and would highly encourage you to buy tickets if it is coming anywhere near where you live. I can't stop thinking about it or listening to their music. Does anyone else feel this way after a concert? Chris Martin is not just an incredible singer but an amazing performer. Since I couldn't videotape the concert for you, I'll give you a sample of someone who did. I am so jealous! Paul is so jealous! We love coldplay. I think they are coming to Vancouver sometime soon...hmmm, I'll have to check on that. I know when I hear people hanging out at the park across the street at 10 at night, I think "aren't you guys tired?" "why aren't you getting ready for bed?" We are so old. How would you say they compared to U2 concerts?